The resources on these pages support content, strategy and marketing teams using social media channels to connect with customers. Whether it’s the Digital Social Media Marketing Academy programmes or social media content strategy development, ask your Academy Manager or Project Manager if you need more information. Blogs and online communities are just some of the ways to harness social media and ‘user generated content’. The sudden rise of social media has created new publishing and marketing techniques. There are many more publishing tools for getting the most from UGC within your online audience. In this Web 2.0 workshop, we start thinking about the practical side of how to harness social networking and collective intelligence to give your website increased traffic and an editorial edge. We explore different types of UGC and provide practical hints and tips on how brands and website publishers can make their content more easily discoverable to help drive audiences. Digital Classroom: Questions about social media? Try to include the title of the topic discussed during the keynote that your question relates to (if there is one). Putting this at the start will help other participants find the topics they are interested in. Examples: The first election won with social media? The US elections were a defining moment for the use of social media in politics. The Obama campaign generated a massive stream of motivating, engaging content that they successfully distributed across email, social media platforms and their own websites. This formed a turning point in how governments communicate with their citizens. At this social media event we bring together four of the leading media and social media brands. Facebook has just celebrated its fifth birthday and is now one of the largest websites in the world, YouTube (now part of Google) pioneered online video content and created a step-change in the role of the web, Reuters is the most well respected news gathering operation in the world and is weaving Twitter into its marketing plans, and the BBC is the country’s largest media and entertainments website. All have found different ways to harness social media, and here you can meet the people driving their plans. Find out more about the people and see what they said about how brands can harness social media. Looking to use Pinterest in your marketing? Here are a few Pinterest marketing tips to get you going. These introductory films that are a great introduction to how Pinterest works for marketing. The rapid growth in audiences on the Pinterest social network has made it an attractive channel for marketers – initially in the US and now in dozens of markets. Pinterest is proving strong at referring qualified traffic to brands, and the design is inherently linked to ecommerce opportunities – far more than Twitter or Facebook at the equivalent stage in their development. Getting social media right is challenging. Many blogs go unread, many forums remain silent and many brand managers waste their time and budget by focusing energy in the wrong direction. Harnessing consumer involvement in product reviews demands understanding the nature of participation and having the right approach to content. Expert reviews should be at the heart of content strategies that rely on translating consumer comments into something meaningful for others to review. These social media strategy notes provide a simple template for getting the right framework in place for expert reviews. Around the expert reviews, simpler participation such as ratings, tag clouds, reviewer ratings and secondary consumer comments can easily be incorporated. Social media, social networks, blogs and online communities have permanently changed online marketing. In this new landscape brands are in a constant dialogue with customers who increasingly play critical roles in advocacy and recommendation. The challenge for marketers is that while the rewards may be rich, the risks are greater. Their brand is just one guest among millions, and nobody is in control. These 10 golden rules grew from training brands on social media marketing across the UK, Europe, Asia and Latin America. Consistently the same patterns emerged: the brands that failed followed few of these approaches, the brands that succeeded had most in place. Here you can find examples of social media research from the last two years with graphs of audience growth for Facebook, Myspace, Twitter and other key social media brands. Bookmark this page and look out for the downloads coming soon. We’re editing together Danny’s slides from the recent lecture about social media. Because 1200 people who applied couldn’t join our session in February (due to the fire capacity) we’ve set up additional small scale workshops of our own here in London in March. Places are limited, and priority goes to TFM&A delegates. 50% discount: We know lots of people travelled to see the session, and the event organisers apologised about the limited places, and that’s why we want to give TFM&A delegates a 50% discount, reducing the full day price to £395+vat. Keeping on top of the latest trends in social networking is a constant challenge. No sooner have you started building an application on Facebook than people want to be your fans. Just when that corporate blog is ready for the next update you find half your office are already on Twitter. From MySpace and Bebo, to the pioneers at AOL and Yahoo, social media presents a daunting array of choices for marketers. Enter the Social Networking World Forum, and a rare chance to see the people you need to under one roof in either London, California or Singapore. They’re high level conference and seminars looks set to deliver some of the latest thinking to brand managers from firms large and small. Join the Digital Training Academy team by dropping by to meet Claire, Peter and more of the team. And if you miss our Ten Golden Rules, then there are free places for several delegates to the show at our social media marketing breakfast in London on Friday. Social media and online social networks allow granular insights into how consumers behave and how they form and change their connections. Analysis of social networks reveals the complex web of connections and can help untangle how information flows through communities. Here is an example of a social network map from Facebook where the connections from one individual have been plotted. Although today’s online social networks only reflect part of the connection people have, these snapshots provide a rich insight into both the individual person and their communities. Social media can deeply damage brands - whether they're running social campaigns or not. When two Domino's Pizza employees contaminated food and released and unpleasant video onto YouTube bragging about their misbehavings, it triggered a mass outcry. Every large organsiation faces control challenges, but the quick response with a CEO video apology and management changes shows many aspects of best practice. ... and remember the more interesting you are, the more we'll listen. The Pepsi brand in the UK was lacking energy and edge. 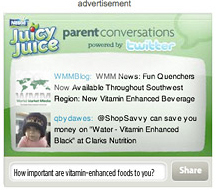 The distributors Britvic opted for an integrated social media campaign that combined sampling, coupon redemption, in-store promotion and the Twitter social media platform. They used a traditional sampling approach of branded street vendors in high traffic areas that matched with good concentrations of the target demographic. The sampling was combined with giving out vouchers for a price promotion that could be redeemed with a single supporting retailer. And the social media came in the form of on-pack branding and a call to action for people to share their opinions at twitter.com/pepsiraw This is one of the first major integrated FMCG promotions to harness the microblogging application Twitter, and the website tool plays two key roles. The site is the latest zeitgeisty tool that reflects well on the brand by simply being there, but more importantly social media users are the typical early adopters and trendsetters Pepsi needs to gain leverage in the market. Here’s a great example of how leading social media brand MySpace linked up with the National Geographic magazine. Click on the links to watch a slideshow case study and follow through to our interview with the MySpace Brazil Vice President when we were coaching marketers in Latin America. Matt Harding is back, and Striding with friends. The cult following of Matt got a boost when chewing gum brand Stride sponsored his next round-the-world adventure. With a few million views online, Matt had a couple of friends who wanted to take part as well. From Quebec to Los Angeles, Paris to Sao Paulo, Mumbai to Madrid , they showed up and in his words, 'danced badly' with him. Coca-Cola enjoys the largest audience of any consumer product ‘fan’ page on Facebook. They achieved an authenticity in the style and tone of the content by supporting consumers who created the page, rather than leading on it within the brand team. The XpressMusic contest’s featured profile was promoted on MySpace, and supported with ad units clicking through to the profile. The submission phase was promoted heavily with roadblocks, and in all MySpace targeted to bands. Each phase was announced via ad placements throughout the site with refreshed creatives for each phase and bulletins posted from the contest page with appropriate calls to action. To promote the launch of Dibs, a new, bite-sized treat from Dreyer’s Ice Cream, Dreyer’s appointed Tracey Locke, ID Society, and MTV Networks Digital Fusion to develop a cross-platform marketing campaign to promote and build brand identity for the product. In addition to on-air promotions, Dreyer’s wanted to drive traffic to an online community where Dibs fans could creatively express their love for the new treat in a contest called the Dibs Bite-Sized Film Fest. Skittles wanted to introduce and raise brand awareness for its new Carnival Gum confectionery product to teenagers and young adults on Facebook. Skittles leveraged Facebook’s integrated advertising platform to build brand awareness for the new Carnival Gum using a combination of Virtual Gifts, Sponsored Stories and the custom Skittles Carnival Gum Sponsored Group branded destination. WhittmanHart Interactive needed to launch a two-month campaign for their client, Sears, which would introduce kids to Sears’ latest line of back-to-school clothes. A social media site would tap popular celebrity and style icons, such as High School Musical’s Vanessa Hudgens and rapper LL Cool J, to promote Sears’ clothing lines in a video shoot and encourage kids to engage with the online content and purchase clothes featured in the shoot. This provided a unique Web 2.0 shopping experience for youth consumers. A rock magazine for 15-24 year olds has a naturally good fit with the profile of early adopting techno-heads. But that doesn’t mean their management team would know how to engage in the digital space or have the innovative spirit to try things out. But they do, they did, and here’s the result. It’s a great example of low cost digital publishing with the content driving brand adorers to build buzz about their passions and discussion about the brand. This iconic, multi-award-winning campaign includes powerful online elements that build discussion and engagement among target consumers. Since 2000, the Dove brand has been one of the online marketing pioneers in consumer package goods. Their work with the IAB and MSN in North America created landmark research in cross media campaign budget optimisation. This more recent video is a great example of how the web can be used by a consumer brand to build community, debate and discussion. The video is part of a multi channel campaign that talks about beauty and creates genuine discussion with and among consumers. The approach of delivering messaging directly to consumers also creates challenges for regulators who are considering how the control of online advertising can work. Here’s a simple example of how one brand has used its own website as a focus for social media activity. Lipton Tea has combined offline promotional mechanics with online content and the YouTube platform to create a focus for consumer generated media. This type of branded content can be a powerful support to any marketing campaign, but for the content top be seen and forwarded across social networks there are high thresholds for quality and entertainment. This is the year that social media hit knock-out scale. In the past most of us have been a member of a Facebook group that struggled to reach the headcount of a Monday night pub. This year social media communication hit massive new audience levels. Groups for and against the comedic acts of Messrs 'Brand and Ross' created immense legions of antipathy roaring against each others temerity for even existing. The Barack Obama campaign brought a succession of genius pieces of social marketing (Remember the 'Yes we can' video featuring Will.I.Am and Scarlett Johansson? Remember the stunning reunion of the Wassup boys ground down by myopic Bush era? These two clips alone were viewed 32 million times on YouTube. In the old days a candidate used to turn up on Letterman or Leno, crack a few gags and hope it gave their campaign some human texture. These two incredible films (and I urge you to remind yourself of the Wassup clip - seeing it again, it is still breathtakingly bold) dwarfed the 4 or 5 million viewers who watch the networked talkshows. A social media election - of course - and its 100th time you've been told it. And for brands? Social audiences love ads. In the days when you were a little firmer, a bit fresher faced a glorious Guinness ad might be seen two or three times in its run. Spotted in the centre break of Murder She Wrote, and each time relished and rewound. Now audiences treat ads as rewarding pieces of film - in the last two months YouTube homepage placements for major TV campaigns have seen advertisers like Barclaycard and T Mobile become our most viewed clips of the week. The video on the homepage of YouTube is seen 6 million times in a day - that's bigger than the centre-break of the last Big Brother final - and bigger than most ITV 9pm shows in the last month. Now is the time for bold brands to get involved. Social media spaces are neither owned nor controlled by marketers. The relationship between the brand and consumers is fundamentally different to the easier model of paid for media space (advertising) that most marketers were initially experienced in. In the social media platforms of Facebook, MySpace, Yahoo and You Tube, the brand is simply one guest among millions. There’s a more equal relationship between the brand and the individual members of that community, as well as a transparency about the brands behaviour both online and offline. Remembering that you’re only one guest among millions is a key learning outcome from the Digital Social Media Academy. In this video we see how you can add a blog feed to a Facebook profile, enabling you to disperse your content further. Online or virtual communities, in their various guises, are fast becoming a me too component of many corporate online strategies, in some cases their whole business model is centred around an online community - eBay, Match and Habbo Hotel. The increase in online communities continues to grow as the internet becomes more deep seated in our day-to-day lives and through the development of technology. What is an online community? Which communities are working? Who is benefiting from them today? How do they support your marketing strategy? Ben Saunders is a record-breaking polar explorer and by his own admission an "extreme blogger". From the North Pole he wrote to millions using his blog, a PDA, a matchstick and a satellite phone. While achieving the record for the fastest solo walk to the North Pole, Ben was able to keep up to date with the progress. In this edition of Digital Thought Leaders he tells how he did it. Blogging has moved from the fringes of the web to the mainstream. Over the last few years, collectively audiences have swelled, and this download of data from Digital's friends at NetRatings, you can see the latest traffic numbers for some of the key blogs and platforms. The term ‘Web 2.0’ covers a cluster of ideas that originally described the DNA of internet businesses that grew rapidly because they drew their strength from the fundamental rules of digital networked publishing. We collated this list of contrasts in the publishing approach to translate what this means for both website owners and marketers looking to use their websites to reach and retain audiences. Alongside our Web 2.0 & Social Networking Academy we run more than 40 other Academies to help marketers of all levels of experience get the most from the internet and the new marketing tools.Download the list of what we're running this term, and email us (TheTeam@DigitalStrategyConsulting.com) with the sorts of topics you feel your team could benefit from more help with.